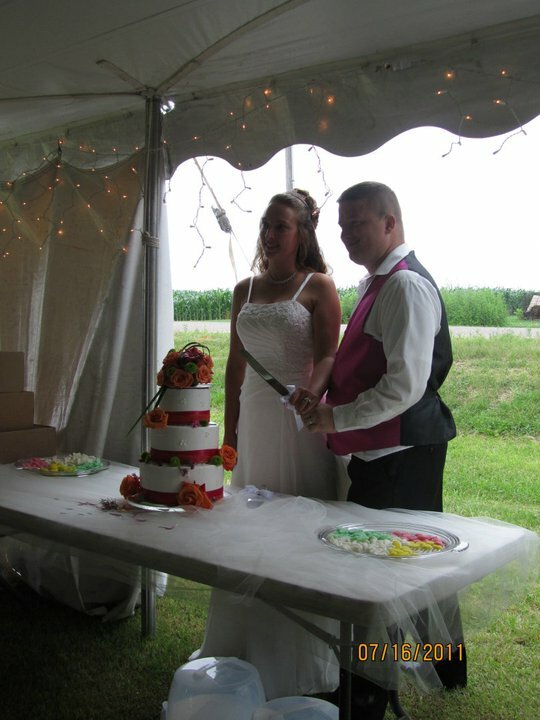 On Saturday, July 16th, I married the man who has become my best friend over the past 2 years or so. We’ve known each other for about 15 or so years. You can read the story of us here. It was an awesome day, though the days leading up to it had a few bumps. Our day was stuck right in the middle of 3 days of rain and a heat wave, so we ended up having to deal with both. You can read the groom’s version of the story here, or read on for the more detailed version of the day. About 2:30 in the afternoon, guests started to arrive. 3:30 came along, and we were ready to go! The Imperial March started, and the bridal party headed down the aisle. People were giggling, and some cheering at the song choice. Two of Jason’s boys laid out the aisle runner, and The Star Wars Theme song started playing. Do you have any idea of what a great march song that is? Yes, we are that geeky! We used star wars songs for our marches! It was awesome! My son walked me down the aisle. He was very nervous about people looking at him. My grandpa performed the ceremony, which was very nice. He almost forgot the “kiss the bride” part, but we made sure that happened! After the Receiving Line (those poor people who had to hug a very sweaty bride and groom since it was about a million degrees out) it was time for a social hour, and a few remaining pictures we needed to have taken. 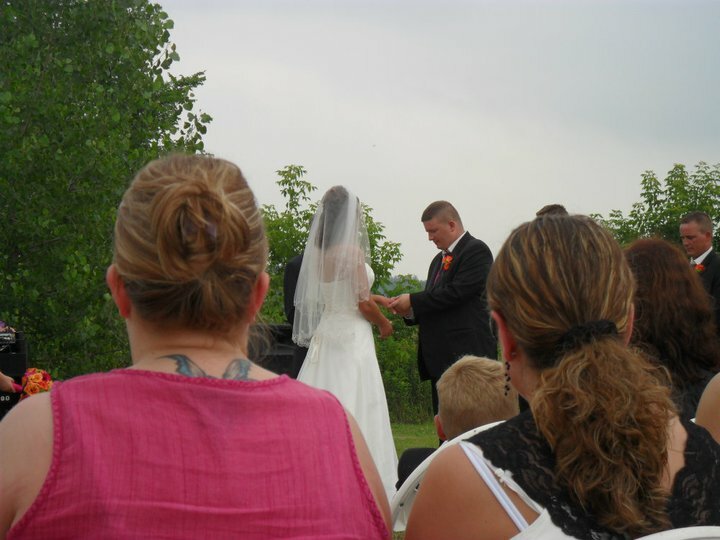 Of course, somewhere in there, we both had to tweet that we were officially married! We had our own hashtag on twitter #stratewedding. Some people posted to it throughout the day, including myself. I was starting to worry about some of our guests that I knew were coming at this point of the day. A few people ended up missing the ceremony due to GPS leading them in the wrong direction. A couple of my friends coming from Chippewa Falls, who followed the “simple” directions I put on our website ended up lost. It was TOTALLY my fault!!! I (unknowingly) put directions from MN only. Instead of saying “go south” on such and such a road, I said “take a right”. A few people ended up finding it, and a few gave up after driving around for a while. Can you imagine how terrible I felt that people had driven all that way (about an hour), only to turn around and go home?? I had my phone on me, but who’s going to call the bride on her big day?!? I still feel bad about it, because I know that the two families who gave up were both really excited to come!! Anyway, the pig got done, the caterer, Twin Cities Flavor, showed up… it was time to start to chow down! I hope SOMEONE got pictures of the pig. It was such a busy day, and it was set up a ways from where most of the action was, so I didn’t even get to see it. It sure tasted good though!! My cousin’s husband, Andy, did a great job! Everyone commented on how good the food was. In fact, between the pig and the sides we had catered in, we even heard guests say it was the best food they’d ever had at a wedding! We cut the cake, and ended up with only a little frosting on our faces! The dance started… Jason and I danced to Marry Me by Train. Then, the wedding party danced. We took turns being silly across the floor. Jason danced with his mom, and I danced with Michael for a mother/son dance. The dance continued for a while until our unwanted guest showed up. You can read one guest’s account of the situation here. A cute little raccoon peeked out from the corn… Apparently, it stayed for a while watching the festivities. Then someone decided to throw cake out to it. This was a BAD idea! It started to cross the road, had a stand off with a van (which was pretty funny). The raccoon continued to come closer to the wedding party, and was not afraid of the 50 or so people lining the road looking at it. The groomsmen fulfilled their “traditional role” of protecting everyone. They were lined along the edge of the tent with chairs, in case the raccoon charged anyone. A friend of mine threw a beer can, hit it in the head, and it just sat there. It started licking up the beer that was left, and proceeded to have a seizure in front of us. Then, it started foaming at the mouth – literally. At that point, I was glad another friend had called 911 to have it taken care of. Not that I wanted anything to die on my wedding day, but I also didn’t want any guests to get bit by the rabid animal either. An ambulance trip for anyone would have surely ended the festivities! A bunch of the guys got brave, and trapped the raccoon under a barrel until the police officer got there. My step-dad went to get his shot gun. 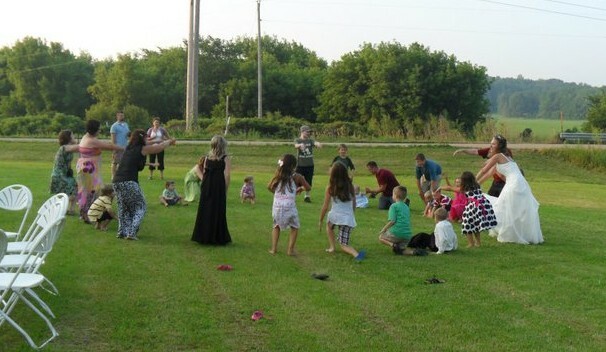 While the raccoon was being “taken care of”, the preschooler teacher in me gathered as many kids as we could for an epic game of Ring Around the Rosie. The kids didn’t need to see anymore of the incident! In the end, everyone was ok (except the raccoon who left with the officer for testing), but some of our guests ended up leaving early, because they didn’t really want to see where the whole thing was going. That was unfortunate. The party went on – we did the garter toss and bouquet toss. My cousin caught the garter. Kind of funny, since he hates weddings. 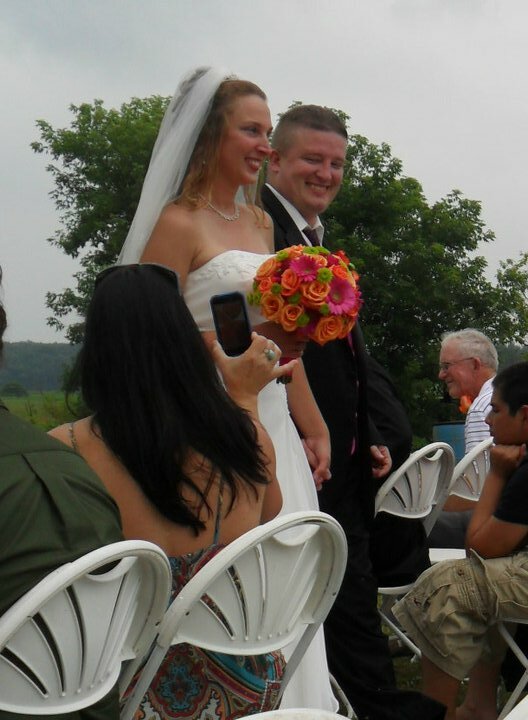 A twitter friend who we met that night, Lauren (@LSquared83|blog) caught the bouquet. We also had a dollar dance. We had to laugh a bit when our friend, Jes (@grrl_geek) asked “What’s a dollar dance?” I didn’t think this was just a MN thing… anyway, the night went on, we had people dancing to Blues Brothers (complete with hats and sunglasses), kids on the dance floor the whole night, some drinking, though mostly not until later in the night… there were fireworks, a couple of which went off sideways (scary). Oh… and we had glowsticks… lots and lots of glowsticks!We even had more party crashers late in the night (though, these were of the human variety). A couple guys heard the music, saw the fireworks, and rode their bicycle-built-for-two over to see what the action was all about. It’s ok, they brought their own beer in the basket of their bike! 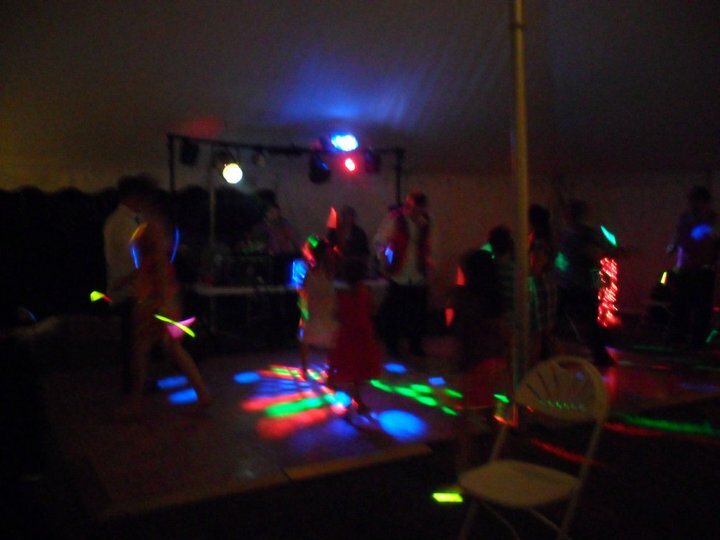 Unfortunately, the groom was sick (and not from alcohol – from heat exhaustion), so he wasn’t cutting it up on the dance floor as much as he would have liked. Overall, the party turned out to be as amazing as we had hoped. The kids are still talking about how great it was! My favorite two quotes post-wedding: “Mom, I didn’t know I could dance like that” (from Michael, my 6 year old). He was amazing! The second came from Jason’s oldest, Nikolai, “You guys’ wedding was pretty epic, wasn’t it?” Yes, yes it was!